October 7, 1922: WJZ in Newark, NJ and WGY in Schenectady, NY collaborated tp become the first radio networks to broadcast a World Series game directly from the Polo Grounds in New York, with Columnist Grantland Rice as the announcer. 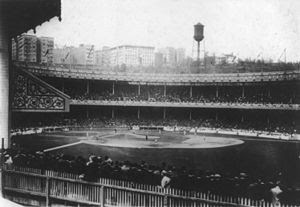 The Polo Grounds were four different stadiums located in Upper Manhattan, New York City. The stadium was used by many professional teams in both baseball and American football from 1880 until 1963. World Series broadcasters conducted numerous experiments via the phone line to ensure that the program could reach the listeners from the East Coast to New Jersey. The broadcast of the World Series was a commercial broadcast that delivered great benefits to the radio station at the time. Ford Motor Company issued the funds of $100,000 to pay for ad impressions on the radio during the game.